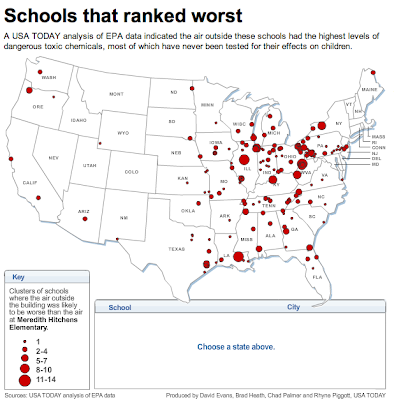 There's an excellent report by USA Today that uses EPA reported pollution data and air modeling to estimate air quality at schools nationwide. It has a good database-backed Web site, too, that lets you look up your school, the schools with the worst air quality from those sources in your state, and so on. I only wish that I had the resources that USA Today does; their database-backed Web site is significantly more polished and user-friendly than I can generally make mine in the time that I have available to work on them. Learning how to embed databases into Google Maps is something I'm going to have to pick up. But there is one map graphic they created that I particularly wanted to call attention to: this -- or as a screenshot rather than an interactive map, so that I can show it here, the map below. Industrial pollution near schools seems to be heavily concentrated in the areas of the country that Garreau refers to as Dixie and the Foundry. That's surprising, in some ways. Other places such as California certainly have industrial pollution too, but perhaps it's more spread out, or further away from city centers. Of course, this particular pollution map doesn't include non-point sources such as cars -- Los Angeles' smog problem gives it much worse overall air quality throughout its region than the vast majority of point-source-polluted sites. 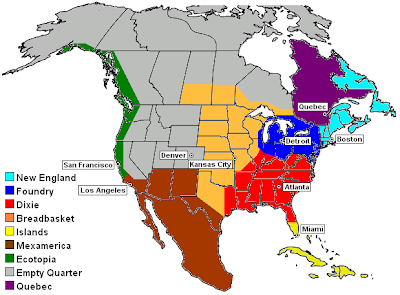 And this map doesn't include all sorts of other sources. But it's an example of how pollution is largely affected by regional patterns of development. If you were mapping environmental damage from mining waste, you'd get a different region of the U.S. highlighted -- national solutions to these problems often come down to regional politics.